Cummin seed or jeera is seeds of flowering plant Cuminum Cyminum. This plant, native of east India and east Mediterranean, belongs to family Apeaceae. During Biblical times, cumin was used as an antiseptic but has been more recently recognised as an excellent digestive and stomach disorder settler. This spice has been praised as jeeraka , jarana and ajaaji for its medicinal qualities in ayurvedic texts. These names refer to its carminative and digestive properties. According ayurvedic principles these seeds balance vata and kapha.The seeds of Cuminum Cyminum have gained their place as main spice in Indian, African, Chinese, Cuban and Mexican cuisines, due to their distinctive popular aroma. It is mainly used to spice and season variety of dishes like curries, chutneys, masalas etc. It is extensively used in India to season dishes. Due to its numerous medicinal properties, jeera is used as an ingredient in many home remedies and ayurvedic preparations. As it normalizes vata and kapha it acts as an aphrodesiac. Diabetes: Take 1/2 tsp of crushed jeera with water twice daily. Cumin is a major spice in Indian and Middle Eastern cuisines. It can be used to flavour most meat dishes and is also good with some types of fish. Whole cumin seeds are often added to lentil and pulse dishes. To bring out the best flavour of the seeds, they are usually toasted in a dry frying pan or with a little butter before adding to other ingredients. Cumin has been used therapeutically for thousands of years and it has a number of healing and curative properties that are listed below. Researchers today are now beginning to look at the components of cumin and study the beneficial effects that cumin has on the body. Although cumin has long been known for its digestive properties, there are also many other ways in which cumin is said to keep the body healthy and heal the unhealthy body. Cumin is a very good source of iron, which is needed to transport oxygen to all the cells within the body. Cumin helps the body to absorb nutrients efficiently. It is said to be a good general tonic and stimulant for the body. It has been used to treat chest and lung disorders such as pneumonia and coughs. Researchers are studying the anti-carcinogenic properties of cumin. It is found to prevent liver and stomach tumours forming in animals. A paste made from cumin seeds and peppermint oil placed on the abdomen is said to relieve abdominal pains and liver disorders. Cumin relieves flatulence, bloating, gas and other related stomach ailments. It can relax muscles and prevent muscle cramps. Cumin is said to help mothers produce more milk to feed their newborn babies. Cumin is sometimes used as an antiseptic and also has antibacterial properties. Cumin can reduce nausea and sickness, even during pregnancy. Mix a spoon of ground roasted cumin seeds ,½ spoon of fresh ginger juice and a pinch of salt in a glass of butter milk. Frequent consumption of this butter milk helps to relieve piles and sooths inflamed intestine. Roasted cumin seeds can be eaten freshen the breath. Chewing roasted cumin seeds can also heal soars in the mouth and reduce excess saliva. Boiling a teaspoon of cumin in a glass of water to make a tea cures problems in the urinary tract, cleans the bladder and kidneys. Cumin and fenugreek when combined together also help to keep the prostate healthy and reduce problems in the male and female reproductive organs and urinary systems. A teaspoon of cumin boiled in water reduces pain in the body and acts as a natural sleep aid for those who have difficulty falling asleep. Cumin tea is very useful for pregnant women during the last month of pregnancy as it helps to ready the uterus for labor and makes for an easier delivery. 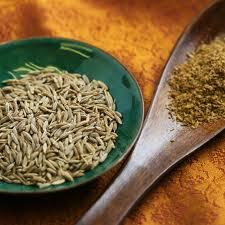 Cumin helps to regulate bowel function and can help to stop diarrhea by eating it with a bit of sugar candy. Cumin and fennel combined in equal parts and chewed or boiled as a tea help to promote digestion. Combined with turmeric and peppercorn it becomes a very good digestive aid and immune booster. Cumin can be chewed after a meal to promote digestion and reduce stomachache. ← Karela – Goodness hidden in bitterness, A valuable herb gifted to us by Mother Nature !! !